Income distribution, infrastructure spending and the tax-welfare system. 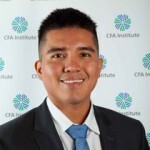 Miguel Ayala explores what we can expect from the 2019 federal budget. A high school student asked the following to a panel of economists at the National Press Club in Canberra this week: ‘What can young people such as myself expect from this year’s budget?’ Angela Jackson, one of the economists on the panel, replied: ‘Probably not a lot, and that is just the reality’. 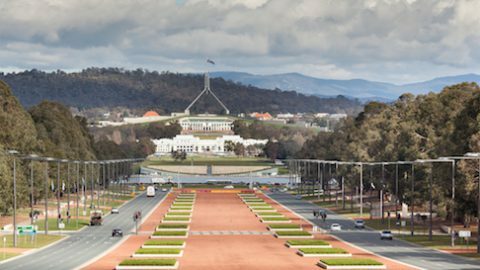 The upcoming federal budget release will set the start of what the Australian government has in mind to present to all Australians for the year ahead. The main ‘successful’ headline for the Coalition as the federal election approaches is to bring the budget back from forecast surplus to real surplus for 2019-2020. However, there are some major structural challenges for the federal government for the years ahead such as intergenerational income distribution, adequate infrastructure spending, and the inefficiencies in the tax-welfare system. If not targeted with a mature fiscal response, these issues may cause lasting economic consequences for all Australians in the long-term. Higher revenues have done the budget repair heavy lifting according to Dannielle Woods from the Grattan Institute. Most of the revenue growth comes from increases in personal income tax collections through bracket creep and higher commodity prices. Bracket creep is when wage growth increases over time, but tax brackets do not increase in line with inflation. 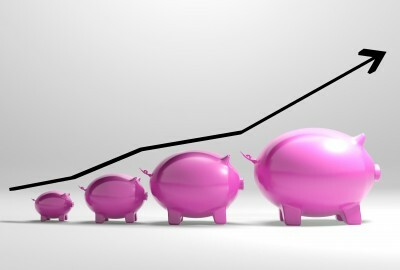 Therefore, people naturally move up to higher income tax thresholds and the rate paid in tax to the government goes up. Higher commodity prices have contributed to an increase in company and profit taxes which are set to outperform forecasts by $2.3 billion according to Deloitte Access Economics. However, these two sources of revenue do more harm than good for the overall economy as they tend to be very unsustainable in the long term. The panel of economists at the National Press Club presented several structural challenges in the long term that the federal government should target through the federal budget. 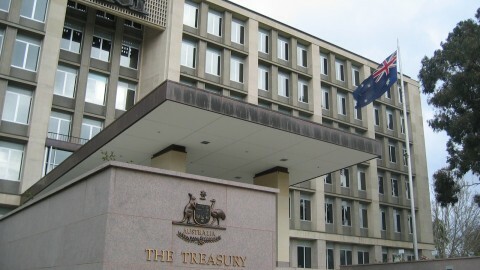 Firstly, the growing generational transfers in the form of tax-free superannuation income in retirement, refundable franking credits and tax offsets such as LITO and SAPTO have made that younger generations currently underwrite the standard of living of older generations to a much greater extent than in the past. One of the solutions presented is to tax superannuation earnings in retirement and reduce LITO and SAPTO. Another suggestion is to the increase the Newstart allowance above the current level of $39 a day. 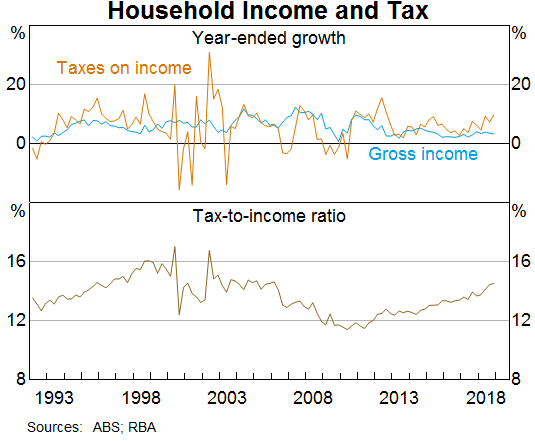 The graph below shows the growth in tax paid which has exceeded income growth and depicts the rising share of income that is paid in taxes. Moreover, there is also evidence in the labour market that higher wage growth in the distribution of wage increases are larger in the form of bonuses in a small fraction of occupations. 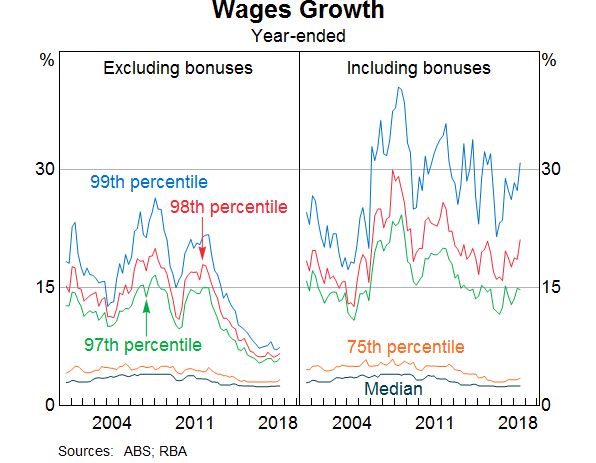 As seen in the graph below, if bonuses are included there is evidence of higher wage growth at the top of the distribution and this is only evident above the 97th percentile. Second, infrastructure spending by federal government is in the form of payments to support state infrastructure services and is weighted to larger projects. 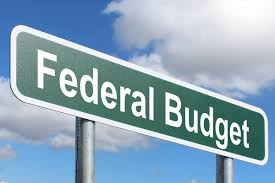 It is likely that we will see large infrastructure announcements in the upcoming federal budget, but this is not a surprise as federal elections are around the corner. The challenge with infrastructure spending is that it is not well targeted to tackle structural dynamics to improve productivity, instead it just creates sugar hits for the economy that do not last. Finally, something that has come to a more broader debate is the level of gender inequality in Australia and the low level of female participation in full employment. This was mentioned by Angela Jackson at the Press Club. It would be interesting to see whether the federal government can integrate this gender issue into the budget as part of the social assistance spending. However, in the meantime we have to wait and see whether the Treasurer uses the federal budget to tackle these economic issues and not as political weapon.